Left to right: Charles "Buddy" Rogers, Clara Bow, and Richard Arlen on the set of "Wings." The Battle of Saint-Mihiel, from "Wings." In this scene from "Wings," recruits make their way to basic training. 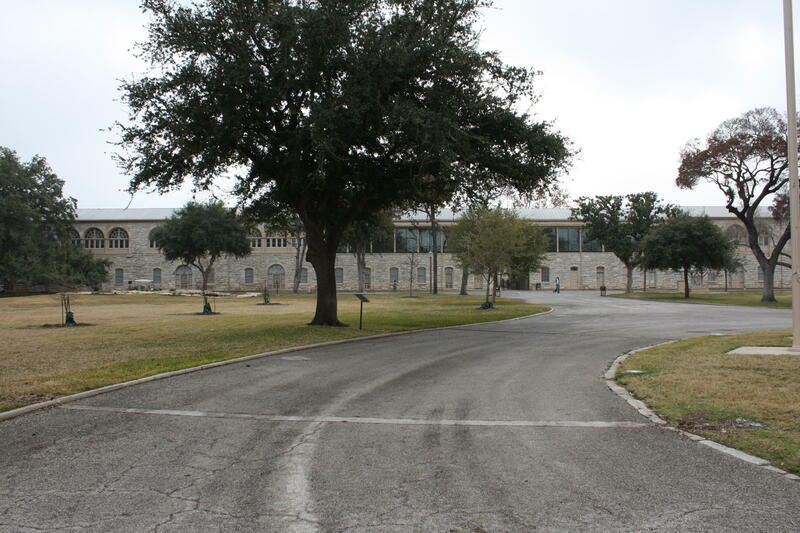 The Quadrangle at Fort Sam Houston looks much like it did in 1927. 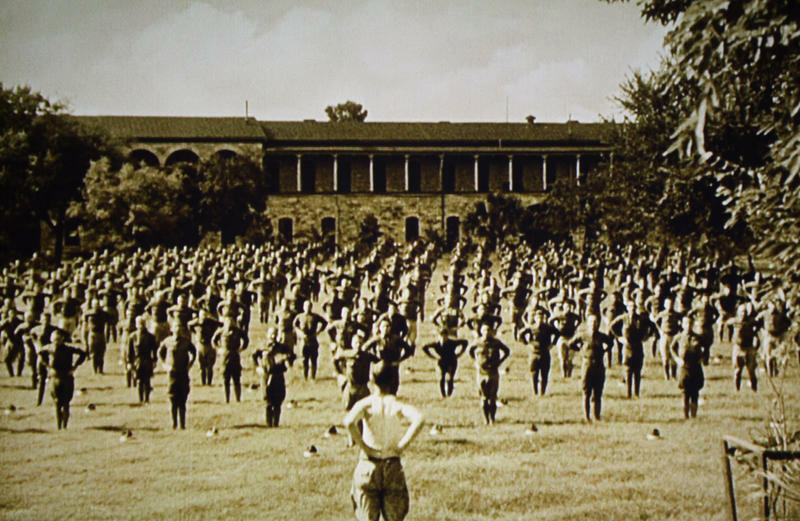 Recruits in basic training, from "Wings." A service road runs through the Quadrangle lawn today. Audio version of story as heard on The Source. This week, a silent film was nominated for the Best Picture Oscar for the first time in 85 years. The last time that happened was at the first Academy Awards ceremony, and the picture that won was “Wings,” shot right here in San Antonio. “Wings” is the story of two young men, played by Charles "Buddy" Rogers and Richard Arlen, who enlist in the Army Air Corps during World War I. Released in 1927, it’s been sitting in Paramount’s vault for years. After a lengthy restoration process, the film is now available on DVD and Blu-ray for the first time ever. "Wings" features spectacular aerial photography, massive numbers of extras, and was the first film to win the Academy Award for Best Picture. It also couldn’t have been made anywhere else, according to Ann Hussey, a historian at Air Education and Training Command on Randolph Air Force Base. "San Antonio was the logical place [to film]," Ann Hussey says, "because we were the home of flying training for the Air Corps. If you wanted to be an Air Corps pilot, you came to San Antonio." When screenwriter John Monk Saunders approached the War Department for advice and support, they agreed that San Antonio was the best place to be. 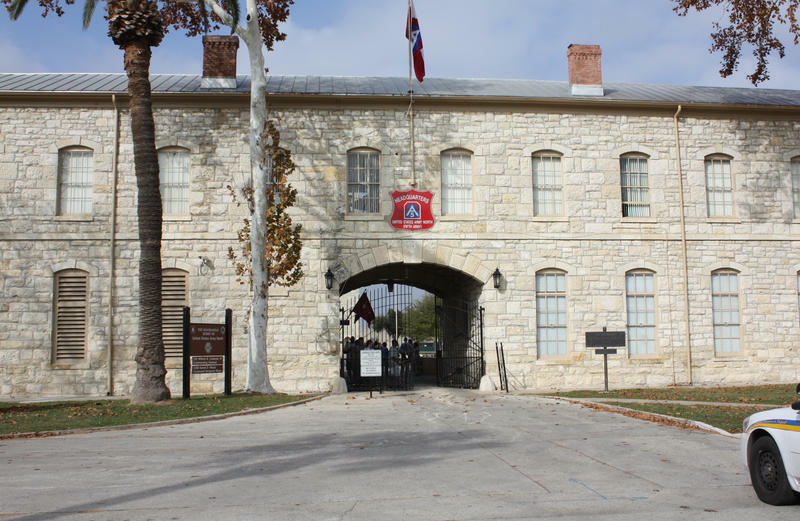 Besides the airfields, San Antonio in the 1920s was also home to one of the largest garrisons of troops in the nation, at Fort Sam Houston. The War Department was excited about the project, but film historian and author Frank Thompson notes they did put forth some conditions before agreeing to support the film. Every military man involved had to be insured for $10,000. Paramount would repair any government property they damaged during the filming, and finally, “The filming would provide legitimate training exercises for the men involved,” according to Thompson. And so, before filming began, troops set up shop at Camp Stanley, a military reservation northwest of town, now part of Camp Bullis. There, they pounded the hell out of the ground with artillery shells, both for practice, but also to give the ground the look of an authentically pockmarked World War I battlefield. For the flying scenes, new camera techniques were devised to shoot the aerial footage. What’s essential to remember is that it’s all real. A special two-cockpit plane was used for the aerial scenes. After a professional pilot got the actors aloft, they would duck down while a camera mounted on the front of the plane shot the scene, with the actor staring dead on into the camera. When you watch the footage today, it’s still exciting enough to give you chills, especially if you’re at all afraid of flying. To see the ground spinning behind the actors on screen is to realize just how dangerous the filming was. 30-year-old William Wellman was chosen over more experienced directors in Paramount’s ranks like Cecil B. DeMille and Victor Fleming to direct “Wings.” He got the job because he, like the writer, John Monk Saunders, had been a flyer in World War I. The studio soon learned how Wellman got his nickname, “Wild Bill.” He was hell bent on getting what he wanted on camera. So Wellman kept the cast and crew on ice while he waited a month for his clouds. “Once he got the footage, then Paramount said, ‘oh, now we see [what you mean],’ but they were not happy with him at all,” Thompson says. The realism extended to the ground battles depicted on film, including the climactic recreation of the Battle of Saint-Mihiel. Ann Hussey says the military pulled out all the stops to help Wellman and the production team. 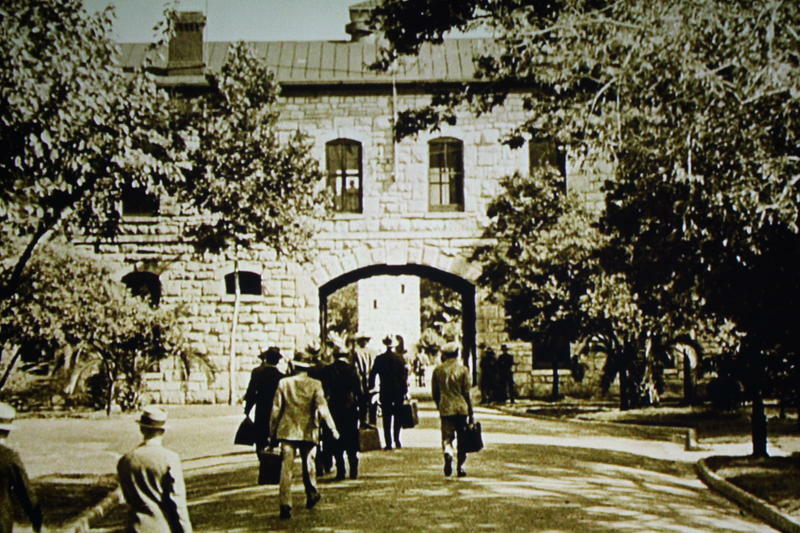 San Antonians who see “Wings” will have no trouble spotting some familiar landmarks on screen in the film, including the Quadrangle at Fort Sam Houston. An early scene in the film depicts scores of men out on the field at Fort Sam, training with a drill instructor. But Jackie Davis, the curator of the Fort Sam Houston museum, says you probably wouldn’t really have found recruits out on the lawn during World War I. “The training would have been in the unit areas. What was going on [at the Quadrangle] would have been the headquarters. There would not have been any basic training going on,” she explains. Nevertheless, the Quadrangle, with its stately clock tower and high, brick walls, looks great on film, and if you visit today, you almost feel like you’re walking back in time. You’re probably less likely to spot most of the other locations in the film, but the “Wings” production team also shot scenes at Kelly Field, and along Culebra Road, where Lombardy poplar trees were spliced to telephone poles to make the area look a little more like the French countryside. Why did the military get behind “Wings?” What was it about the movie that led them to invest so heavily in the project? Ann Hussey says at a time when military funding was low, during the 1920s, “Wings” was the “Top Gun” of its day, a way to boost interest in the Air Corps. “Wings” premiered in San Antonio on May 19, 1927, and ran nationwide for two years with a live orchestral accompaniment, and in-theater sound effects provided by a battery of percussionists and effects men. Since that time, no one has seen “Wings” in a way close to its original form, until now. Paramount Pictures, working with the Academy of Motion Picture Arts and Sciences, has restored the film to its original glory, from a cleaner picture, to the restoration of color tinting and a special process called Handschiegl that painted bursts of orange flame in scenes where explosions take place. 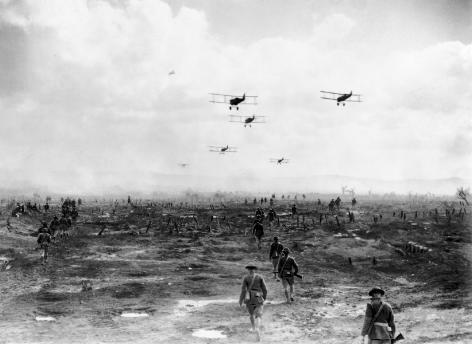 For the audio track, the orchestral score has been re-recorded from the only known copy of the music at the Library of Congress, and Academy Award-winning sound effects artist Ben Burtt, whose credits include the Star Wars films, was engaged to recreate the World War I era sound effects track. The result is a film that’s every bit as thrilling today as it was in 1927. Once upon a time, Hollywood landed in San Antonio. And with the help of our armed forces, made a classic that can now be rediscovered by a whole new generation. “Wings” remains the biggest production ever to hit the Alamo City, and the only one to win an Academy Award for Best Picture. As film historians will note, it’s also the only silent film* to win the Best Picture Oscar as well. *NOTE: A month after this article was posted, "The Artist" won Best Picture. Complete interview with film historian Frank Thompson.